Children of alcoholics are six times as likely to witness domestic violence, three times as likely to consider suicide, and twice as likely to experience problems at school, according to the National Association for Children of Alcoholics (Nacoa). The charity is aiming to highlight the devastating impact that alcohol abuse is having on families, and says there are 2.6 million children in the UK living with an alcohol-dependent parent. Nacoa, which advises and supports children of alcoholics, says it saw an increase in the number of requests for help it received last year. Despite receiving more than 20,000 calls, the charity says the issue is still largely invisible. Many children are unwilling or unable to get the help they need, leading to issues that can persist long into their adult lives. “To young people who might be struggling with a parent who drinks too much we like to say ‘you are not alone in your struggles and you are justified in the way you feel’… and that help and support is there”, said Nacoa ambassador Josh Connolly. 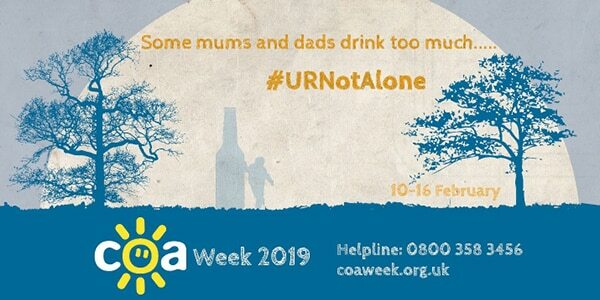 Children of Alcoholics (CoA) Week is an international campaign to raise awareness of the millions of children affected by a parent’s drinking. Some of the patrons of the campaign have shared their experiences to help break down the conspiracy of silence around children of heavy drinkers. Shadow health secretary Jonathan Ashworth who said he was delighted to support and be associated with Children of Alcoholics week. “Two years ago, following the inspirational lead of friends like Liam Byrne and Caroline Flint, I chose to speak out publicly in a Parliamentary debate about my own circumstances growing up with an alcoholic father. Since that moment I’ve been a passionate supporter of this cause helping persuade the government to allocate some funding to help children of alcoholics”, he said. If you have concerns about alcohol misuse, AlphaBiolabs can provide a number of alcohol testing solutions including continuous alcohol monitoring. Please call 0333 600 1300 or email us at info@alphabiolabs.com for more information.